Happy Sunday my friends! It still doesn't feel quite 'normal' to do all of our normal things yet. I'm sure this next week will be better. I taught Sunday School today and it went well, but, things still feel transitional! It was good to be back in our home ward/congregation though. These people are our church family. It was good to see familiar faces and be welcomed back. I got this fun Tshirt dress while in UT. There will be much of that phrase coming up! I love to shop at several stores every year when I go visit and I always seem to find plenty that I like and want to bring back home! My girlfriend Lynette and I have a tradition of shopping at Down East Basics each year! We find killer deals and always leave with bags full of clothes! This year was no exception! I will show you all of my fun purchases soon. Anyway, this striped T-shirt dress is from Down East Basics. Here is the exact dress linked for you! 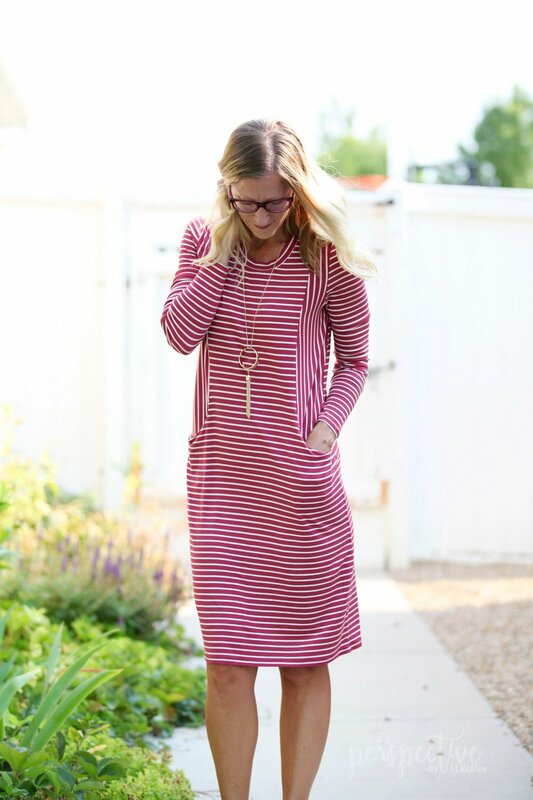 I love the directional changes of the stripes on the dress, the easy fit, and of course the pockets! I styled my dress with a cute pair of booties, that I also got from there. They are called the Gillian Low Heeled Sandal. I love them! I've worn them several times already! Yea for cuteness! My cute niece is interested in photography and we did a trade! I took pictures of her and she took some of me. It was fun to connect that way! Of course you can click on the links above to find these items. Here are more t-shirt dresses and booties I think are cute.